Should You Lower Your Tyre Pressures When You Take Your 4WD Offroad? If you’re just starting out with 4WDing, you’ve probably already realised just how much fun it is to go off-road! It can get seriously addictive, whether you like beach 4WDing or bush 4WDing. Along the way you’re going to get a lot of tips for taking your 4×4 off-road, some good and some less-than-stellar. 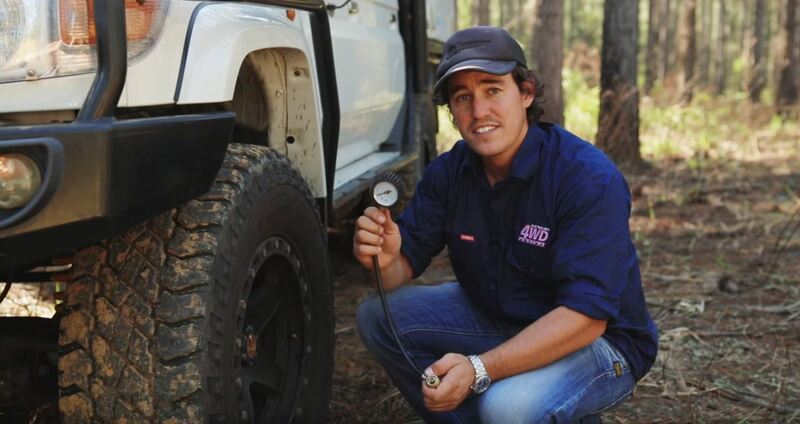 Regardless of how modified your 4WD is, there’s one trick every 4WDer needs to know, and that’s how to adjust your 4×4’s tyre pressures so you don’t get bogged. You might think you need the biggest, chunkiest mud tyres to not get stuck. While that’s true for very muddy, sloppy types of terrain, you’ll be blown away with how much more capable you can instantly make your 4WD if you do something as simple as let some air out of the tyres. So why is that? There’s two reasons why you should let your tyres down when you head off-road. The first is so that your tyres have a chance to mould themselves around the terrain you’re driving, reducing the chance of the tyre being damaged. The second is that the lower your tyre pressures are, the bigger its ‘footprint’ or contact patch with the ground is. That means your 4×4 can sit up on top of the terrain instead of sinking down into it. Imagine the difference between standing in thick mud in your bare feet, versus wearing a set of thongs. The wider the contact patch, the less you sink into the terrain. In a moment we’ll talk about the best tyre pressure for sand, and the right tyre pressure for 4WDing in the bush. First, let’s talk about the gear you need to safely and correctly lower your 4×4’s tyre pressures. 1.TYRE DEFLATOR: The first thing you need to let your 4WD’s tyre pressures down is a tyre deflator. Yes, you can theoretically do it with a stick, but it’s not accurate and it takes forever. A much better idea is to use either the Adventure Kings Kwiky Tyre Deflator, or the Adventure Kings 3 in 1 Tyre Deflator. Just attach it to your tyre valve, and accurately use it to drop your 4WD tyre pressures to the right level. 2. TYRE GAUGE: Did you know your tyres heat up during the day as you drive? That’s because as air heats up it changes pressure. The Adventure Kings Kwiky Tyre Gauge is perfect for instantly checking your 4×4 or SUV tyre pressures throughout the day to ensure they are always correct. 3. PORTABLE AIR COMPRESSOR: Throughout the day you’ll find you might need to put air back into your tyres. Maybe you’ve finished driving up the beach and you’re heading for a bush campsite, or you’re done 4WDing for the day and need to air back up to the right tyre pressures for on the road. A portable 12v air compressor like the Thumper MKII air compressor or the Thumper Max compressor will let you quickly and easily re-inflate your tyres. 4. TYRE REPAIR KIT: It’s good practice to always carry a tyre repair kit like the Hercules Tyre Repair Kit. If you do get a flat tyre when you’re out in the bush, often you can fix it yourself by plugging the hole. It’s surprisingly easy to do, if you can find the stick, rock or nail that’s punctured your tyre. Then, all you do is use your 12v air compressor to re-inflate your tyre and you’re right to keep driving! So what are the best tyre pressures for 4WDing? The general rule is beach driving tyre pressures should be around 16psi, and bush 4WDing tyre pressures should be around 24psi. That’s a starting point, and if you feel like your 4WD is still struggling you can try taking a bit of extra pressure out of the tyres, maybe dropping another 4psi. In an emergency on the sand, you can drop your tyre pressures as low as 10psi, but be aware that if you’re already bogged, this will just lower your vehicle closer to the sand and can actually make things worse. The other huge benefit to lowering your tyre pressures is that it massively smooths out the ride! If you’re on a rough, rocky dirt or gravel road and you’re getting bounced all over the place, drop your tyre pressures down to around 28psi even if you are still in 2WD and aren’t having any dramas with traction. You’ll be blown away by the difference it makes!